Follow-up drill program currently underway. TORONTO, Feb. 12, 2019 (GLOBE NEWSWIRE) -- Probe Metals Inc. (TSX-V: PRB) (OTCQB: PROBF) (“Probe” or the “Company”) is pleased to provide new results from the 2018 drill program on the Val-d’Or East Courvan property area (the “Property”) located near Val-d’Or, Quebec. Results from thirty-nine (39) drill holes, totaling 11,819 metres, were received and identified both new discoveries as well as confirmed significant expansion of previous discoveries north and west of the Former Bussiere Mine (see figure 1). The 100%-owned Property is located approximately 1.5 kilometres west and adjacent to the New Beliveau deposit. Significant drill results are presented below. 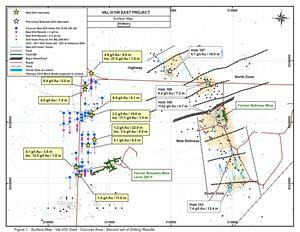 The 2018 drilling program at Courvan has allowed the identification of 12 new gold structures over an area of 2.5 kilometres by 1 kilometres around the old Bussiere Mine, all located within a short distance of the Company’s current resources. The mineralized zones are similar to those observed along the Pascalis trend with large envelopes of quartz-tourmaline veins and associated alteration. Visible gold is common within the mineralization. (1) All the new analytical results reported in this release and in this table, are presented in core length and uncut. Additional drilling is planned for the immediate area which will enable the true width determination. The Courvan Property is adjacent to the Company’s New Beliveau deposit at Val-d’Or East and unlocks significant exploration potential to the west of the New Beliveau mineralized system. The Property land package is largely unexplored, with limited historic diamond drilling in the vicinity of the past-producing Bussiere Mine. Gold-bearing veins historically mined on the property consisted of quartz-tourmaline-pyrite veins associated with shear zones and diorite dykes, similar to what is found in the New Beliveau deposit, approximately 1.5 kilometers to the east. The Bussiere Mine produced 42,000 ounces at a grade of 5.8 g/t Au between 1932 and 1942 before being destroyed by forest fires. The scientific and technical content of this press release has been reviewed, prepared and approved by Mr. Marco Gagnon, P.Geo, Executive Vice President, who is a "Qualified Person" as defined by National Instrument 43-101 - Standards of Disclosure for Mineral Projects ("NI 43-101"). During the last drilling program, assay samples were taken from the NQ core by sawing the drill core in half, with one-half sent to a certified commercial laboratory and the other half retained for future reference. A strict QA/QC program was applied to all samples; which includes insertion of mineralized standards and blank samples for each batch of 20 samples. The gold analyses were completed by fire-assayed with an atomic absorption finish on 50 grams of materials. Repeats were carried out by fire-assay followed by gravimetric testing on each sample containing 3.0 g/t gold or more. Total gold analyses (Metallic Sieve) were carried out on the samples which presented a great variation of their gold contents or the presence of visible gold. Probe Metals Inc. is a leading Canadian gold exploration company focused on the acquisition, exploration and development of highly prospective gold properties. The Company is committed to discovering and developing high-quality gold projects, including its key asset the Val-d’Or East Gold Project, Quebec. The Company is well-funded and controls a strategic land package of approximately 1,000-square-kilometres of exploration ground within some of the most prolific gold belts in Quebec. The Company was formed as a result of the sale of Probe Mines Limited to Goldcorp in March 2015. Goldcorp currently owns approximately 13.7% of the Company.